Properly diagnosing and repairing water heater problems requires a general understanding of how they work as well as a fair amount of mechanical ability. If you suspect a problem, contact us today and let us help you decide on the quickest and most effective method of getting the water heater problem solved today! 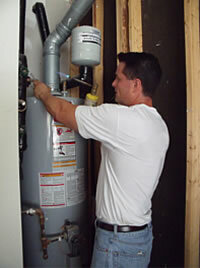 We also specialize in many other plumbing services for homeowners in Cary, Raleigh, and Apex. We look forward to serving you!